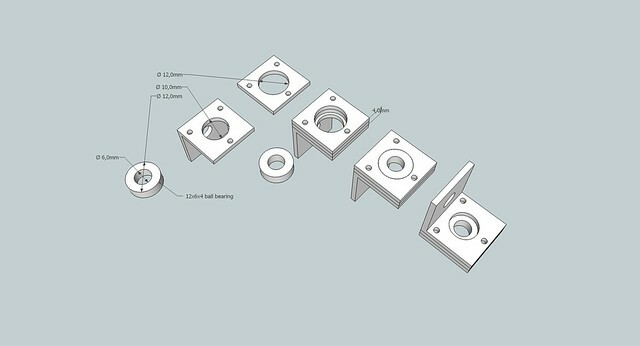 I'd like opinions on this idea for a ball bearing mount. I really like the simplicity of the one in the contraptor set, but in my mini-cnc when building they popped off very often. Also the bearing I will get for the big-cnc project do not have edges that sharp/square, they are a bit rounded so that will make it more difficult to stay in place with that technique. My current idea is to entirely surround the ball bearing. This only needs two small pieces of aluminium ( or maybe some lasercut plastic, maybe cheaper and/or simpler ) with a hole the size of the ball bearing, and smaller holes for screws. 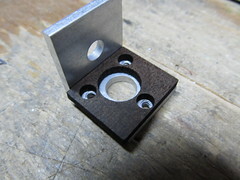 And then the angle is drilled the same way, but with a bit smaller diameter for the ball bearing hole, which makes the ball bearing hold. Here is how I implemented the same idea - with lasercut insert. Additional problem I tried to solve was that it's not as easy to make an accurate shaft mount with all three screws exactly on the edge of the circle. 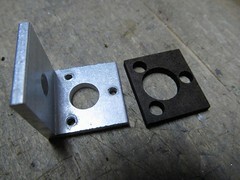 I don't have this problem with production-quality shaft mount, but it is an issue for DIY. Lasercut insert on the other hand is small and cheap.